Show the one you love how you feel with a pendant she'll keep close to her heart. 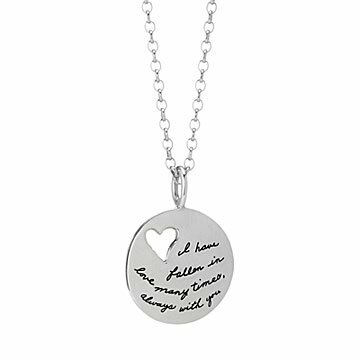 Etched with the sentiment, "I have fallen in love many times...always with you," this pendant is a perfect way to tell your sweetheart how you feel—without saying a word. Handmade by BB Becker, each high-polished, sterling silver medallion features BB's wife Jo's handwriting for a personal dimension to the engraving, and no two pieces are exactly alike. The heart cut-out creates a beautiful silhouette symbolic of your shared love. Falling in love prompted BB Becker's first attempt to make jewelry: He found used pieces to deconstruct and reassemble into gifts for his future wife. Today his designs are a collaborative effort, as Josephine’s handwriting is engraved on each piece. The preferred method of cleaning is to rub with a soft, clean, lint-free cloth. To remove oxidation rub gently with a paste of water and baking soda, rinse thoroughly and dry. Use of some dipping solutions, abrasive cleansers, or anything other than a soft, clean cloth may damage the finish.